Not a Snow White for me, it was an Alice. 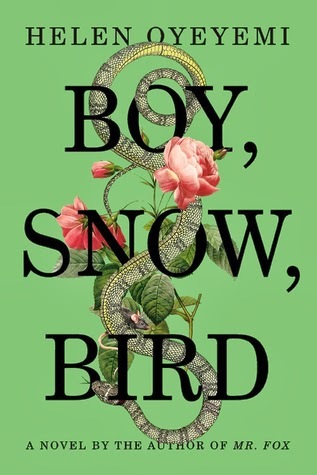 Synopsis of Boy, Snow, Bird by Helen Oyeyemi: In the winter of 1953, Boy Novak arrives by chance in a small town in Massachusetts, looking, she believes, for beauty—the opposite of the life she’s left behind in New York. She marries a local widower and becomes stepmother to his winsome daughter, Snow Whitman. Boy (despite the name, is female) lives with her abusive father, who ekes out a living as a rat catcher in 1950s New York. She escapes the drudgery of her existence by simply hopping on to a bus to nowhere, anywhere, finding herself in the small town of Flax Hill in Massachusetts. There she starts life anew. Boy marries a soft-spoken widower, Arturo Whitman. He has a beautiful daughter, Snow, who is doted upon by the entire Whitman family. The birth of their baby girl, Bird, reveals a secret of the Whitman family has been keeping -- they are pale-skinned Afro-Americans pretending to be white. White-skinned Snow is sent away to relatives. The sisters grow up in separate homes but eventually reestablish contact. They become close and in their letters back and forth, they slowly realize that their families have more secrets begging to be revealed. This entire novel is jarring. I felt like Alice slowly falling into the rabbit hole. The beginning started out wonderfully, albeit a little strange, but I suspended all judgement. But it got curiouser and curiouser ... and weirder and weirder. I felt that the book held great promise because of the themes it set out to explore. It touches upon race, interracial marriages, standards of beauty, and towards the end, gender. These are difficult subjects to write about but Oyeyemi manages to weave these into her story in a unique way, allowing room for the reader to ponder and make their own judgements. The writing has a beautiful fantastical quality to it and there are tinges of magical realism. There is the allegory to Snow White—a snake in jewelry, recurring references to the "mirror, mirror on the wall," Bird claims not to show up in mirrors, and other odd little references which get the reader asking "true? or metaphor?" The cover. I would pick this up just based on the cover. There I said it. Problematic storyline: Overall, I felt that this was half-finished (or is it half-edited?) as the arch of the storyline started out in one direction then suddenly veered away from what was built up. Half-baked characters: What interesting characters Boy, Snow and Bird are! Unfortunately, they never really endeared themselves to me. The two better characters are Boy and Bird. Boy with her terrible childhood roused some sympathy in the beginning but I found she was quite flat throughout. Bird was interesting but she felt "old" in her dialogue; I couldn't put my finger on it but she seemed to somehow morph into Boy to me at some points in the story. Iffy back book blurb. Touting that a book is a mash-up or re-telling (think Cinder) could go very, very badly. While it wasn't bad per se for this book, it didn't help it, setting up false expectations. The Snow White allegory was there but it certainly wasn't the highlight. Verdict: Not a Snow White for me, it was an Alice, and that's not a compliment. A promising storyline that fails to deliver on so many levels. I received a copy of the book through Penguin.ca's Bloggers and Books Network in exchange for an honest review. Thank you, Elizabeth! I liked the Icarus Girl, but couldn't even finish Mr. Fox by Oyeyemi. They do choose gorgeous covers for her books, though. I'll pass on this one. I've heard good things about Oyeyemi's writing so maybe I'll try Icarus Girl and maybe enjoy that one! I ordered this for my nook after reading all the accolades about it; now I rather wish I hadn't. Well, I'm so busy reading the long list for the Independent Foreign Fiction Prize I won't get to it until a month from now anyway. Glad for your revealing review. I'd love to hear what you thought when you read this. I may just not get "it." Oddly, your less than stellar review of this book is the first one that made me actually want to pick it up. :) I don't know what that's all about. Thanks for hosting as always! Have a great week! Thanks for sharing. I like how you broke your review down in sections. Stopping by from Carole's Books You Loved April Edition. I am in the list as #28. My book entry is below.